To all you wallies, I had the pleasure of meeting with Jamie Hall and touring the property that he tends to. If you have a couple of hours of time and are in the North East you have to visit. Jamie is a wealth of knowledge, we discussed many subjects in addition to his 1930 Hoffman equipped two pipe system. It always amazes me when you meet someone over one interest and the individual shares at least three of four other interests. The home is truly unique and beautifully curated. In every sense, it is like stepping back in time. I ended up tying together this trip while rescuing a 1953 toilet for my vintage basement bathroom rebuild. Bottom line, you should make a trip to Connecticut. It was a real pleasure, @Mike Cascio -- thank you for taking the time to come by! And the rest of you -- come on up! But most think I'm nuts. What brand toilet is it? I have an extra crane from the 1960’s that I will no longer need. Jamie, I would love to get come out someday. It's a long way from the Midwest, but I'm sure it would be worth the trip. It is. Jamie, is the old coal furnace still in the corner? Is there still coal in the bin? Cue @Jamie Hall with "What are you nuts!?!?" Yes it is, @Noel ! Good to hear from you! The vent away is quite a unique toilet. I had to acquire a Standard Cadet to replace the one I broke while renovating. Luckily I found one on EBAY for cheap. Don’t ask how I broke it. It’s quite embarrassing. @Mike Casio. That toilet is worth the trouble to go fetch as you did and rebuild. One of the few, before American Standard left the reservation. I'm restoring it, not Mike. 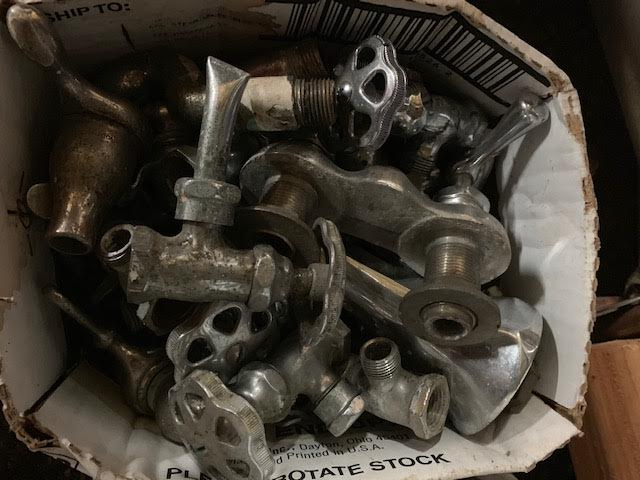 Speaking of American Standard, I saved these old flush valves from toilets that got replaced and I still have the large diameter leather washers, just in case someone still has one. I love the way they work and how they're made. 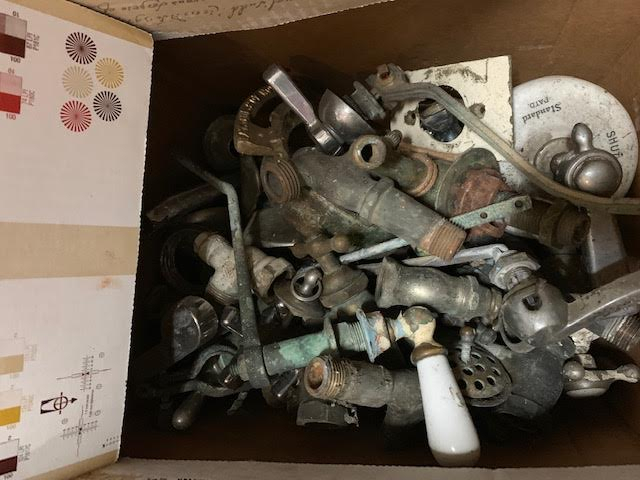 What era toilets had those valves? I have a 1926 devoro, 1929 ejecto and 1953 cadet. I thought all of these used the douglas style flush valve with ball and rods. @Mike Cascio took the time to discuss his experience meeting @Jamie Hall and the beautiful facilities he manages. And you bums turn it into toilet talk. Shame. To get into Jamie's league, you could at least be discussing the Toto Super Blaster Supreme. > @Mike Cascio took the time to discuss his experience meeting @Jamie Hall and the beautiful facilities he manages. And you bums turn it into toilet talk. > Shame. To get into Jamie's league, you could at least be discussing the Toto Super Blaster Supreme. What's wrong with toilet talk? We all know Jamie has nothing against vintage toilet talk. Those were actually designed by someone named Curtin and were sold under that name also. A-S must have licensed the design. I have at least one with a threaded shank that can fit the usual tank. Mike Cascio: I don't remember the toilet style or vintage. Perhaps an old low-boy, but I could (easily) be wrong. The ones in the pic were from low-boys. Complete curtain flush valves as well as repair parts are still available. Never got into plumbing. Pipefitter, Gasfitter & Electrician was enough for me. Just can't get thrilled with toilets and sinks. 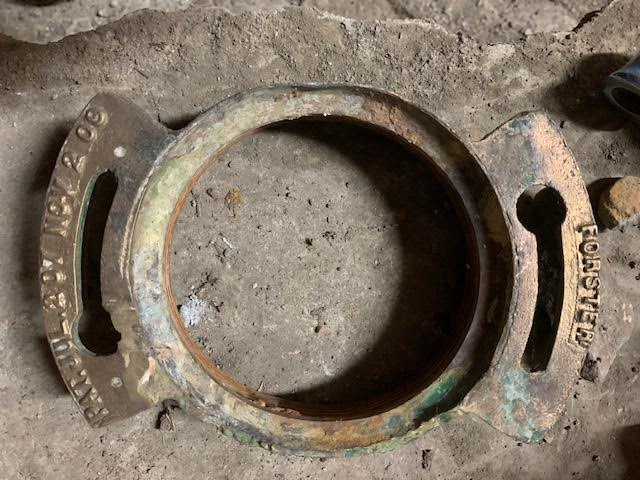 Or, search for "Curtain valve 50"
EBEBRATT-Ed: How can you not get excited about a 100 year old Forster threaded, brass closet flange or American Standard angle stops? 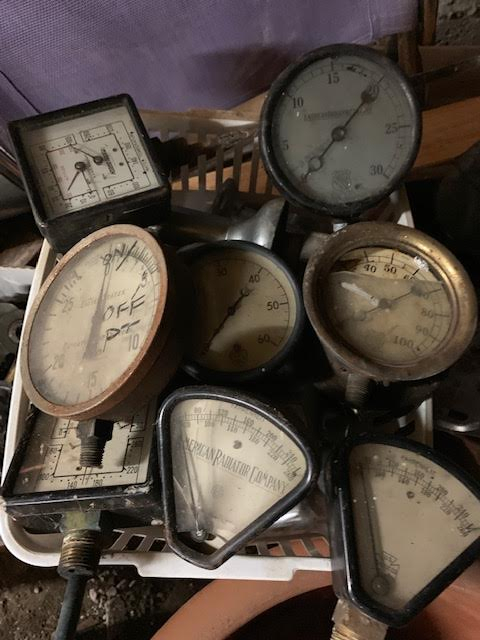 When you replace an old boiler that has a beautiful, old gauge, do you just throw it away? I just can't do it. My basement is a testament to my abilities as a plumbing hoarder. I've got a wine cellar that has a couple of empty walls where I plan to hang some architectural wire and mount all this. Whether it will come about is a function of my longevity. Alan, now I know where to go for vintage parts! That is a nice collection. The closet flange is really cool. 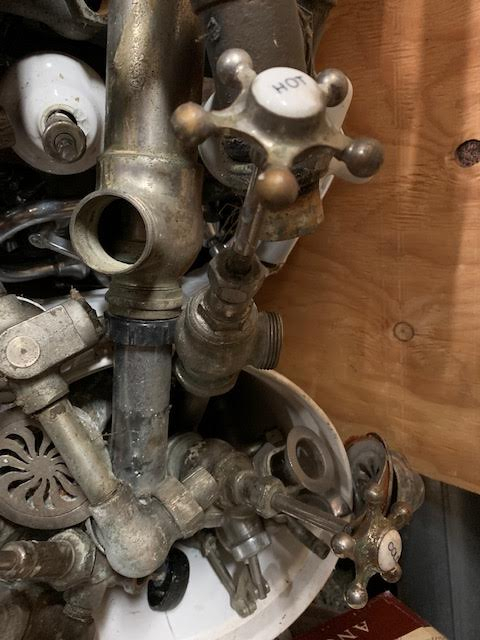 I like @Alan (California Radiant) Forbes 's collection of odd plumbing bits -- I thought I had a pretty good collection, but he's way out of my league! 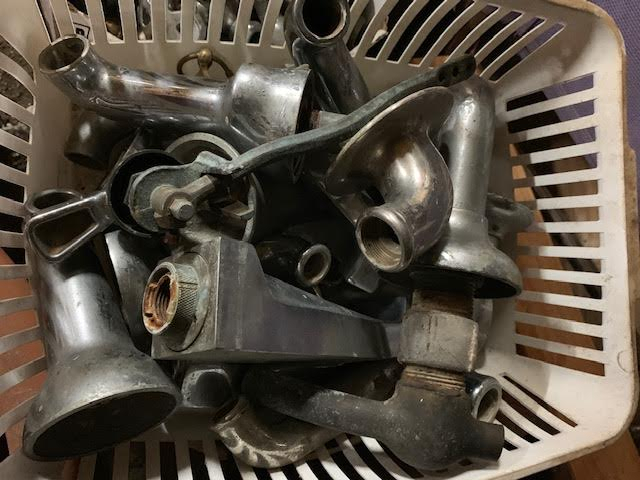 The trick with those things is to figure out just what they are, to begin with, and then find replacements for the bits that wear out (like giant economy size faucet washers -- never mind resurfacing the seats on those puppies). The ones I really dislike are the mid 50s ones, which have unique bits -- from companies long since gone. Right. I've heard that Steamhead is a collector. He even has a museum going. @Jamie Hall I have been meaning to make a visit to your place when i'm in that area of Ct this summer. Hope to see you. I like the way you explain things. @Alan (California Radiant) Forbes That flush valve pictured above was probably the best one ever designed. Was not the easiest to replace until I found A right angle pair of needle nose pliers to hold the nuts in the tight space in the tank. With those pliers it became a very nice repair. @Dave in QCA Thanks for that info as to where to purchase. @Alan (California Radiant) Forbes Thanks for sharing those pics. Looks like you have a nice little museum too. 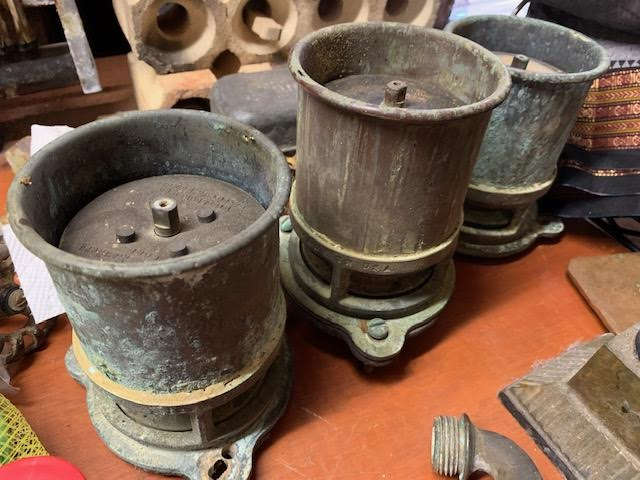 @Alan (California Radiant) Forbes , not a museum per se, but we do have a fair-sized collection of old heating stuff. Just off the top of my head, I can think of a Differential Loop, a couple Webster return traps, and some really unusual traps like an outboard-type Broomell.